Dental trauma comprises 5% of injuries among children and adolescents. And where 25% of all school children would have experienced some sort of dental trauma before the age of 19, the younger age group commonly experiences luxation types of injuries, while adolescents experience hard tissue types of injuries., The upper central incisors are the most common teeth to be affected by trauma; furthermore, such trauma has been related to increase overjet. Where an injury frequency of 14.2% was recorded in children with normal overjet (0–3 mm), the percentage increased to 28.4% in children with an increased overjet (3.1–6 mm), and raised to 38.6% in children with extreme overjet (>6 mm). This means children with an overjet of more than 6 mm were three times more likely to receive trauma to their upper incisors than children with an average overjet. Avulsion of permanent incisors comprises 0.5–3% of all types of dental traumas, and it is usually associated with space loss for that tooth., Moreover, this could be complicated by other malocclusion characteristics, such as narrow maxilla, Class II skeletal pattern, mandibular deficiencies, and to make things even worse, some crowding. Class II skeletal pattern can be treated with growth modification in growing patients.,,, Functional appliances are one of the most common techniques for growth modification. They provide extra- and intraoral forces to influence the jaw's growth., In addition to the functional appliance's ability to correct antero-posterior problems, it can also correct vertical and transverse relationships. Functional appliances can create spaces indirectly by reinforcing anchorage and/or expansion. The effect of functional appliances differ depending on the design, however, they introduce dental and skeletal changes as a result of stretching the soft tissue and muscles. Twin Block appliance is one of the appliances indicated for the treatment of Class II skeletal relationship. It was developed by Clark in 1980s, and it is one of the commonly used functional appliances,,, partly due to its acceptability by patients. The following is a case in which the Twin Block appliance design was modified to treat a Class II skeletal problem and to open a space for a missing maxillary central incisor. This work will focus more on the space opening aspect for the missing incisor. The patient was a Caucasian male who presented at the age of 13 with a Class II, Division 1 malocclusion on a Class II skeletal base. The upper incisors were proclined, with space loss in the upper left central incisor area due to loss of the central incisor after an avulsion trauma at the age of 8. The overjet was increased (7 mm), and the overbite was average and incomplete to the palate. 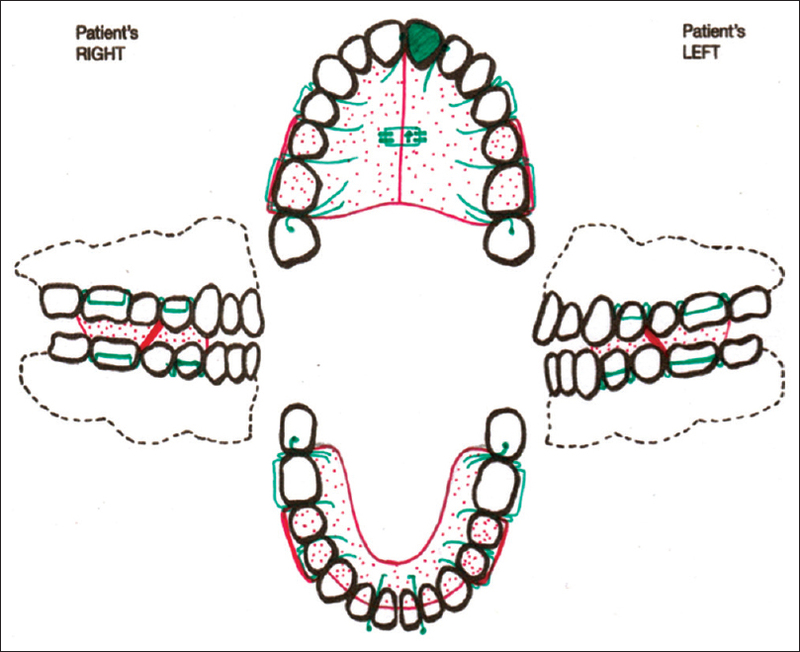 The buccal segment was a full unit Class II on the right and a one-half unit Class II on the left [Figure 1]. Canines were Class II on both sides. The gingivae was inflamed specially around lower incisors, indicating the presence of gingivitis. The orthopantograph (OPG) showed that all permanent teeth roots appeared to be of normal size, morphology, and at a normal developmental stage. The unerupted upper second premolars, right second molars, and third molars were in good developmental stage. Pneumatization of the maxillary sinus was seen around the upper molars. The upper left central incisor was confirmed as missing [Figure 2]. The cephalometric radiograph and analysis [Figure 3] showed ANB value of 6°, which suggests that the patient had a Class II skeletal pattern. This was supported by the Wits analysis (+3 mm). The ratio of lower to total anterior face height was average. The maxillary-mandibular plane angle (MMPA) was at higher end of normal range indicating that posterior face height was slightly reduced. The upper incisors were proclined at 124° and the lower incisors were at the lower end of the normal range at 88°, which was due to the influence of the lower lip. The lower lip lay on the Ricketts E-plane, possibly due to the high tip of the nose [Table 1]. The patient was in cervical vertebral maturation stage II; stages II to III are optimum for growth modification. Model analysis showed a mildly crowded lower arch (4 mm), missing upper left central incisor, which is associated with space loss (3 mm). In occlusion, the patient had a 7 mm overjet, average, and incomplete bite to the palatal mucosa, and coincident upper to lower dental midlines. Special investigations on upper incisors showed normal teeth color and normal responses to percussion and cold test. The patient was sent first to school of hygiene to manage the gingival inflammation and improve his oral hygiene. The treatment was planned to be carried out in two distinctive phases. In Phase I, we aimed to utilize growth to reduce overjet, achieve Class I molars and canines, and provide more space for the missing incisor. This was to be achieved via a Twin Block appliance to be worn full time (18 hours/day) for 9 months, then only for 3 months during night time. The bite was registered using a projection stick, the patient was asked to bite while bringing his mandible forward where the incisors got to edge-to-edge relationship. 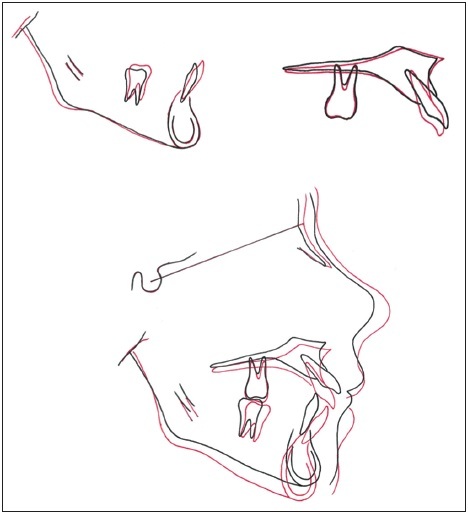 The design of the appliance was modified by adding two C-clasps; one was mesial to the upper left lateral, and the other was mesial to the upper right central, where each clasp was attached to a different acrylic plate to create space for the missing incisor during expansion [Figure 4]. The design composed of 0.9 mm stainless steel Adam clasps on first molars and premolars, in addition to ball-ended clasps on lower incisors. Occlusal stops (0.8 mm) on upper and lower second molars were used to control second molars' eruption, 10 mm expansion screw and C clasps between upper central and lateral were added to upper acrylic plate; this would allow expansion and space opening for upper central incisor. In Phase II, upper and lower 0.022” × 0.028”, preadjusted Edgewise appliances with an MBT prescription were used to consolidate the canine and molars in Class I, maintain the overbite and overjet correction, correct rotations, detail teeth alignment, and idealize the space for the upper left central incisor. Retention was to be achieved via upper and lower Hawley retainers. Other functional appliances could be used as an alternative to Twin Block in Phase I, such as Activator appliance. The Headgear treatment is another alternative, but not advised in this case, as it has a restraining effect on the maxilla, while advancing the mandible would help the facial profile more. Twin Block was chosen over Activator due to higher patient acceptability. Extraction of upper premolars could be used; however, it will not be the best approach as it will not help the Class II patient profile. The aims of Phase I were achieved successfully; the appliance design and patient compliance helped with that. 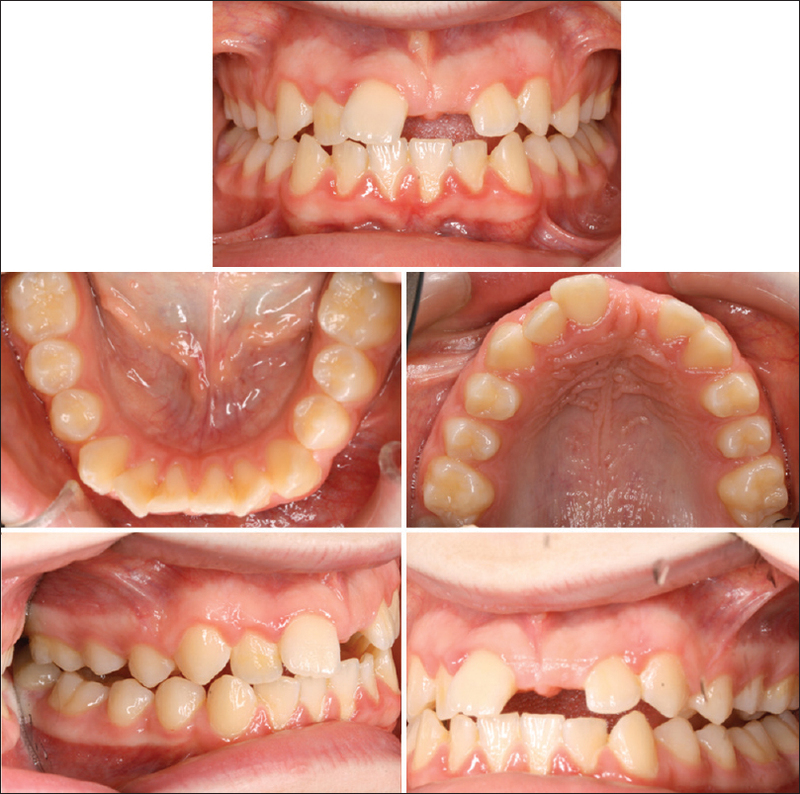 The overjet was reduced via mandibular advancement and change in incisor inclination. Canines and molars were over corrected to Class III, and space for the missing upper incisor was increased (by 3 mm) as a result of the expansion; however, the overbite was maintained [Figure 5]. Oral hygiene was also maintained. The second phase of treatment was with the preadjusted, edgewise fixed appliance (0.022 × 0.028 MBT) and aimed to level and align teeth to achieve Class I molars, canines, and idealize the space for the upper left central incisor. Phase II lasted for 12 months. An acrylic tooth with a bonded bracket and extended acrylic phalanges helped to maintain the space and improve patient esthetics [Figure 6]. The overall treatment time was 24 months, i.e. 9 months of functional appliance usage, followed by 3 months' transient phase between functional and fixed, then finally a 12-month fixed appliance treatment phase. The end of treatment photos demonstrates the space created for the missing central incisor [Figure 7]. The space increased from 5.5 mm at the beginning of treatment to 8.5 mm at the postfunctional phase. This space was maintained at the end of the fixed appliance treatment. Periapical (PA) radiograph at the near end of treatment showed good roots parallelism for upper right central and upper left lateral incisors, which is important for implant placement in the future. The maxillary transverse dimension changed due to expansion, and the intermolar and inter-premolar widths increased because of expansion [Table 2]. At the end of phase II, the patients' lack of compliance in wearing Class II elastic and maintaining an adequate oral hygiene resulted in terminating the treatment and accepting the current occlusion to prevent further deterioration in oral hygiene. The finishing OPG showed that the roots are generally of acceptable parallelism except for the root of the upper right lateral incisor and upper premolars, which appeared to be mesially tipped. Second-order bends were placed into a 0.019 × 0.025” SS arch wire to correct this during the finishing phase of the case. 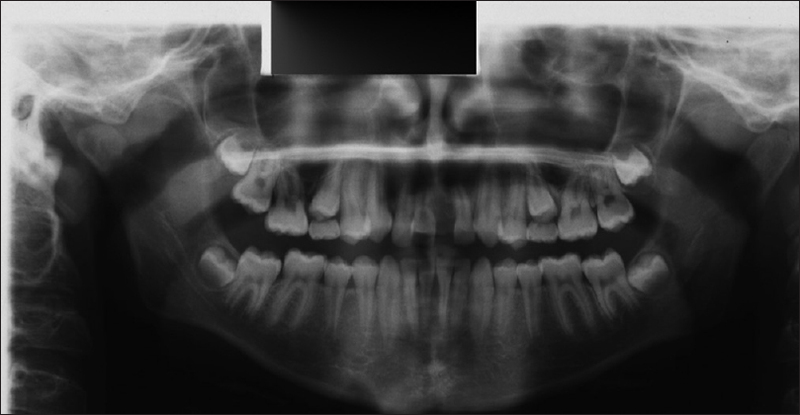 There has been no significant change in the position of the developing lower-third molars, which remained unerupted. The long cone PA showed good root parallelism around upper left central incisor space, which is ideal for implant placement; slight blunting was associated with the roots tip of upper right central and lateral. No other pathology or abnormal anatomy were noted [Figure 8]. The posttreatment cephalometric tracing [Figure 9] and analysis [Table 1] showed that ANB value has reduced from 6° to 4°. Interestingly, the Wits have reduced indicating an improvement in the skeletal pattern. The lower anterior face height ratio was not changed significantly, however, the MMPA value has increased by 2° during treatment indicating more growth in the anterior face than the posterior face. The upper incisors were retroclined by 14°, while the lower incisors were proclined by 8° during the treatment; this is within the normal range and the change was reflected in the reduced overjet. The interincisal angle has been corrected to the normal range, which aims to improve the stability prognosis. There was also a marked change in the relationship of the lower lip to the E-plane, which is due to the improvement of the lower lip position and maturation of the soft tissues. The overall superimposition registered on the anterior cranial base at Sella demonstrates that there has been a significant amount of vertical growth during treatment. The overall vertical growth of the facial complex appeared to continue inferiorly and posteriorly, which indicated an element of posterior growth rotation. The anterior changes involved soft tissue remodeling and maturation. The maxillary superimpositions on the palatal vault and maxillary plane showed evidence that the upper incisors have been retroclined leading to bony remodeling at A-point. The mandibular superimpositions on Björks' stable structures demonstrated lengthening in the mandible. 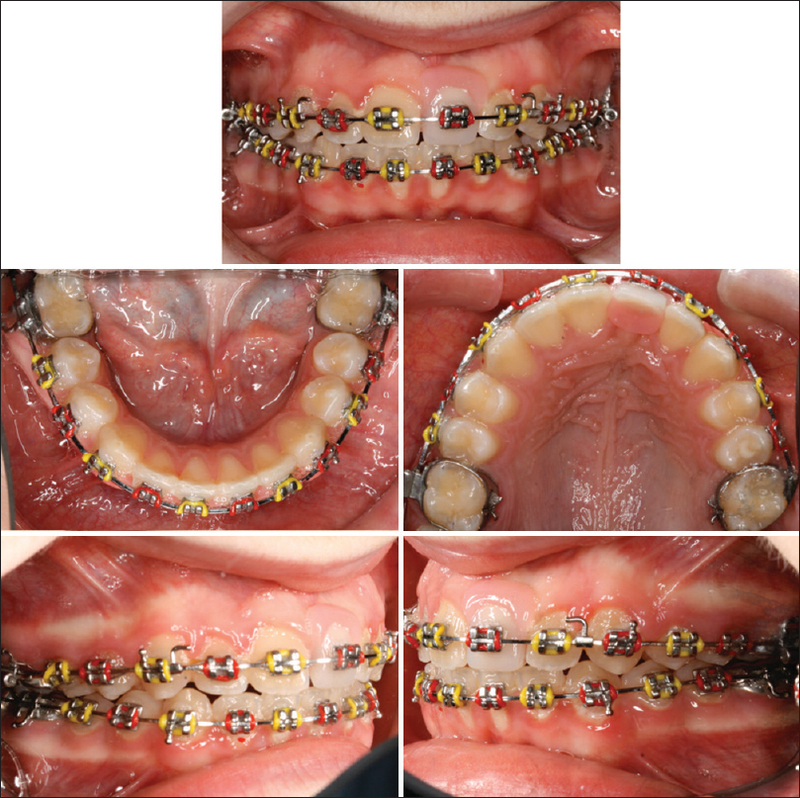 The growth changes seen during the fixed orthodontic appliance treatment phase appeared to be limited to remodeling of the ascending ramus and gonial angle. The lower molars got more mesial and extruded position. The lower incisor position exhibited a small degree of proclination. Class II correction could be attributed to functional appliance (growth modification) and favorable forward skeletal growth.,,,,, With growth modification, the correction is mainly due to skeletal and dental changes, which include upper incisors retroclination, lower incisors proclination, upper molars distalization, lower molar extrusion and mesial drifting, restriction in maxillary growth, and acceleration in mandibular growth.,,, The lower molars' extrusion is usually compensated by vertical growth in the ramus. O'Brien et al. (2003), related around 60% of overjet correction to dental changes and 30–40% of the correction to skeletal changes. In this case, the mandibular superimposition showed a backward and upward mandibular growth, which leads to downward and forward mandibular translation, as reflected in the overall superimposition. Moreover, upper incisors got retroclined, while lower got proclined, which contributed to overjet correction. All the above explained the Class II correction; however, none of these changes explained the space creation for the missing central incisor. Space creations in orthodontic treatment usually come from molar distalization, incisor proclination, interdental stripping, extraction, and lastly, arch expansion. 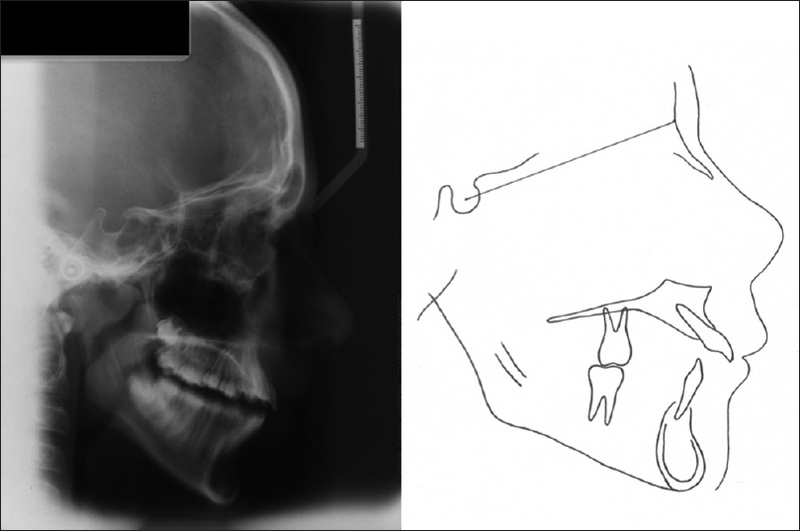 All the options were carefully examined for this case before deciding on the most appropriate approach to open the space for the missing tooth. Molar distalization required a Headgear, which was not favored by the patient, and incisor proclination was not a valid option as the patient started with existing proclined upper incisors. Interdental stripping is usually indicated whenever there is a Bolton discrepancy,, which again was not the case here. Extraction of upper bicuspids and opening the space for the missing central was a valid option, but the patient, who already had a missing tooth, did not appreciate this option. This left us with the option of expanding the upper arch. Expansion is known to create space, where 0.5–0.7 mm of space is gained for every 1 mm of posterior arch expansion.,, This was the most suitable option in this case for several reasons. First, expansion is known to be stable when it is in mixed dentition; moreover, it was required to avoid any relative crossbite development  due to mandibular advancement and correction, and it can be done with relative ease using the Twin Block appliance. The mandible grew favorably (forward) and corrected the sagittal (Class II skeletal) problem (as shown by overall superimposition) [Figure 10], so no space was required in the upper arch to correct the increased overjet, which means all space created from the expansion was used in space adjustment for the missing central. Although the contralateral central incisor was 9 mm, the space created for the missing incisor was 8.5 mm; this created a 0.5 mm discrepancy between the incisors, which could be compensated for by stripping the present central 0.25 mm. The decision of dental stripping was left for the esthetics dentist. Ideally, the implant should be placed after the growth ceases, which is after the age of 15 in female patients and 18 in male patients. If the implant was placed during active growth, it would be displaced or malpositioned by continued growth (extrusion of the implant might occur as a result of remodeling of alveolar ridge) and may require removal and replacement. The patient started his treatment at 12 years of age and finished around 14 years of age, which is not a favorable age for dental implant due to the continuation of growth. 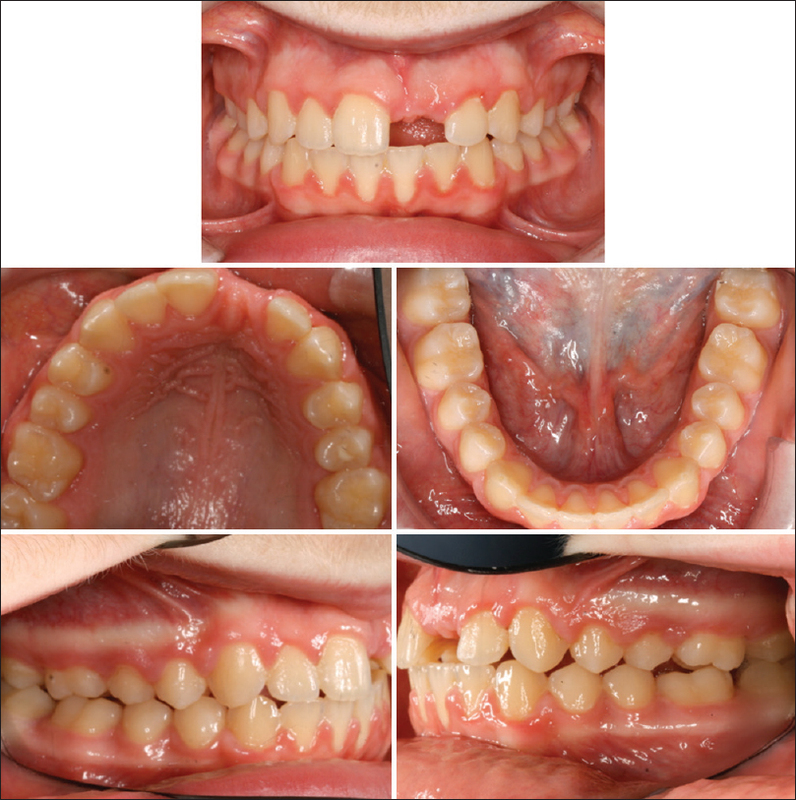 For this reason, the patient was provided with a retainer with a prosthetic tooth (riding pontic) and was referred to get a resin-bonded bridge cemented as a temporary solution until he passes the active growth phase. Functional appliances can be modified and adjusted to serve other than their classic purposes; space creation is one of these. 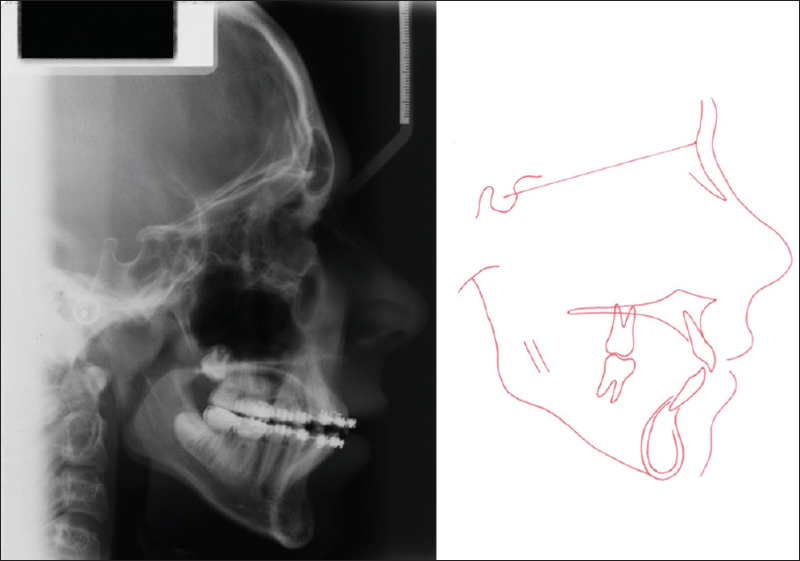 Twin Block appliance's ability to expand the maxilla while correcting the sagittal relationship helped this case significantly. The authors declare that there is no conflict of interest regarding the publication of this paper. The patient consented for the use of his records except the extraoral photos to protect his identity. Petersson E, Andersson L, Sörensen S. Traumatic oral vs non-oral injuries. Swed Dent J 1996;21:55-68. Andersson L, Andreasen JO, Day P, Trope M, Kenny DJ, Lenzi AR, et al. Guidelines for the management of traumatic dental injuries: 2. Avulsion of permanent teeth. Pediatr Dent 2016;38:369-76. Di Angelis AJ, Andreasen JO, Ebeleseder KA, Kenny DJ, Trope M, Lenzi AR, et al. Guidelines for the management of traumatic dental injuries: 1. Fractures and luxations of permanent teeth. Pediatr Dent 2016;38:358-68. Jarvinen S. Incisal overjet and traumatic injuries to upper permanent incisors. A retrospective study. Acta Odontol Scand 1978;36:359-62. Baccetti T, Franchi L, McNamara JA Jr, Tollaro I. Early dentofacial features of Class II malocclusion: A longitudinal study from the deciduous through the mixed dentition. Am J Orthod Dentofacial Orthop 1997;111:502-9. O'Brien K, Wright J, Conboy F, Mandall N, Lewis D, Read M, et al. Effectiveness of treatment for Class II malocclusion with the Herbst or twin-block appliances: A randomized, controlled trial. Am J Orthod Dentofacial Orthop 2003;124:128-37. Thiruvenkatachari B, Sandler J, Murray A, Walsh T, O'Brien K. Comparison of Twin-block and Dynamax appliances for the treatment of Class II malocclusion in adolescents: A randomized controlled trial. Am J Orthod Dentofacial Orthop 2010;138:144. Santamaria-Villegas A, Manrique-Hernandez R, Alvarez-Varela E, Restrepo-Serna C. Effect of removable functional appliances on mandibular length in patients with class II with retrognathism: Systematic review and meta-analysis. BMC Oral Health 2017;17:52. Jena AK, Duggal R. Treatment effects of twin-block and mandibular protraction appliance-IV in the correction of class II malocclusion. Angle Orthod 2010;80:485-91. Chadwick SM, Banks P, Wright JL. The use of myofunctional appliances in the UK: A survey of British orthodontists. Dent Update 1998;25:302-8. Mills JR. The effect of functional appliances on the skeletal pattern. Br J Orthod 1991;18:267-75. Dietschi D, Schatz JP. 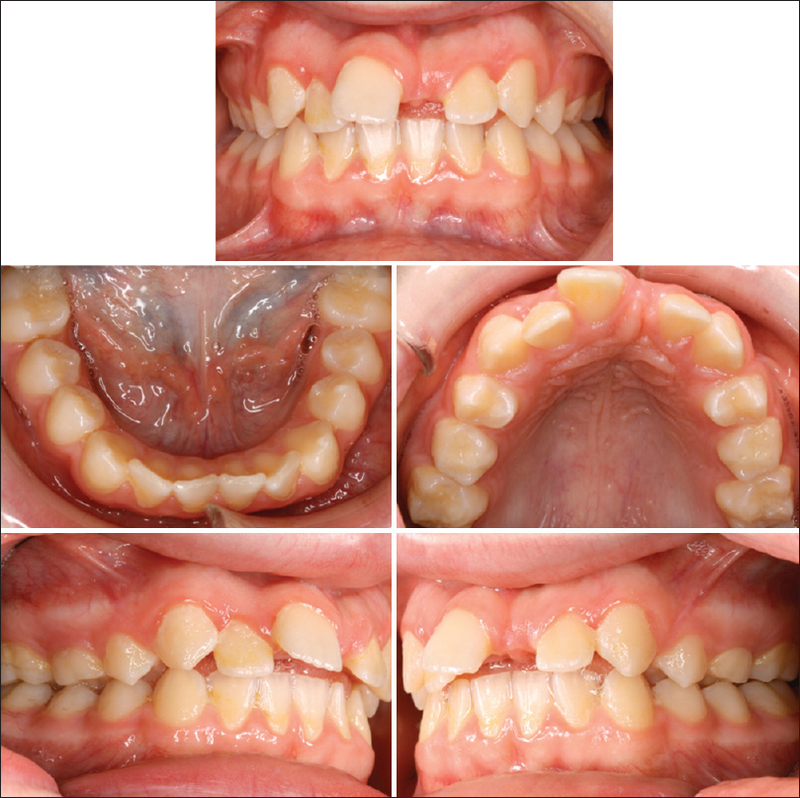 Current restorative modalities for young patients with missing anterior teeth. Quintessence Int 1997;28:231-40. Chandorikar H, Nagrik A, Bhad WA, Chavan SJ, Doshi UH. Early correction of unilateral scissor bite using transforce appliance and modified twin block appliance. J Orthod Sci 2017;6:76-80. Mills J. The application and importance of cephalometry in orthodontic treatment. Orthodontist 1970;2:32-47. Mantysaari R, Kantomaa T, Pirttiniemi P, Pykalainen A. The effects of early headgear treatment on dental arches and craniofacial morphology: A report of a 2 year randomized study. Eur J Orthod 2004;26:59-64. O'Brien K, Wright J, Conboy F, Read M, Murray M, Lewis D, et al. Effectiveness of early orthodontic treatment with the Twin-block appliance: A multicenter, randomized, controlled trial. Part 2: Psychosocial effects. Am J Orthod Dentofacial Orthop 2003;124:488-94. DiBiase AT, Cobourne MT, Lee RT. The use of functional appliances in contemporary orthodontic practice. Br Dent J 2015;218:123-8. Schaefer AT, McNamara JA Jr, Franchi L, Baccetti T. A cephalometric comparison of treatment with the Twin-block and stainless steel crown Herbst appliances followed by fixed appliance therapy. Am J Orthod Dentofacial Orthop 2004;126:7-15. Spalj S, Mroz Tranesen K, Birkeland K, Katic V, Pavlic A, Vandevska-Radunovic V. Comparison of Activator-Headgear and Twin Block treatment approaches in Class II division 1 malocclusion. Biomed Res Int 2017;2017:4861924. Kirschen RH, O'Higgins EA, Lee RT. The Royal London Space Planning: An integration of space analysis and treatment planning: Part I: Assessing the space required to meet treatment objectives. Am J Orthod Dentofacial Orthop 2000;118:448-55. Kirschen RH, O'Higgins EA, Lee RT. The Royal London Space Planning: An integration of space analysis and treatment planning: Part II: The effect of other treatment procedures on space. Am J Orthod Dentofacial Orthop 2000;118:456-61. Akkaya S, Lorenzon S, Ucem TT. Comparison of dental arch and arch perimeter changes between bonded rapid and slow maxillary expansion procedures. Eur J Orthod 1998;20:255-61. O'Higgins EA, Lee RT. How much space is created from expansion or premolar extraction? J Orthod 2000;27:11-3. Cronin RJ Jr, Oesterle LJ, Ranly DM. 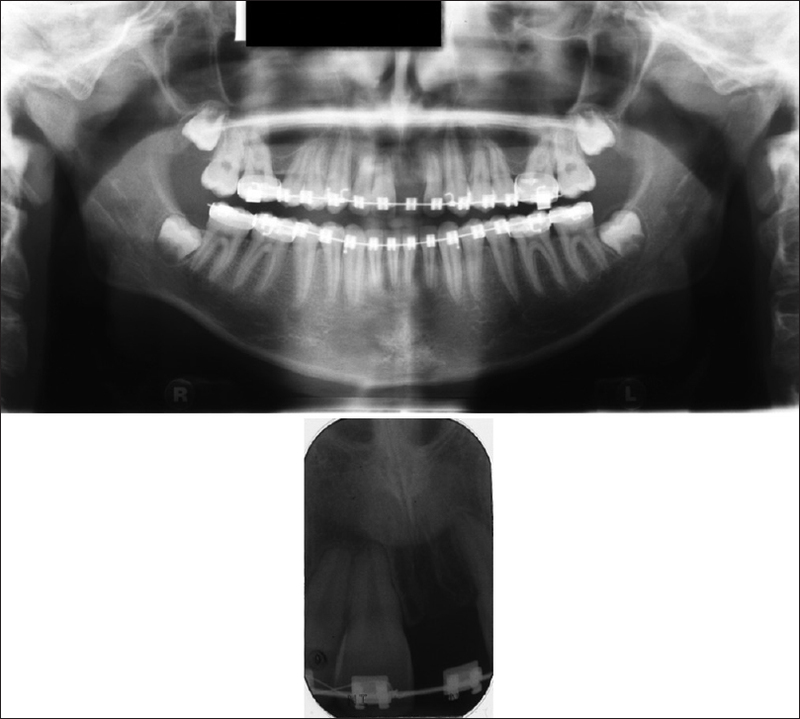 Mandibular implants and the growing patient. Int J Oral Maxillofac Implants 1994;9:55-62.